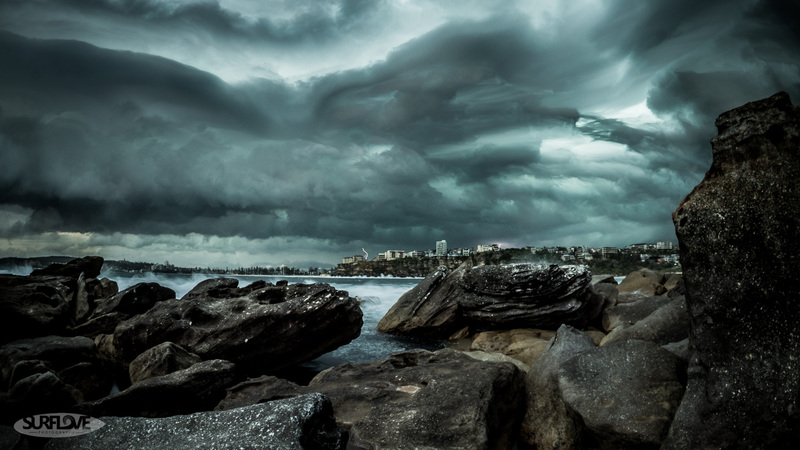 Nature has been putting on quite the show over Sydney in the past few days, with some very dramatic storm fronts pulling over the blue skies in the late afternoon creating apocalyptic style scenes. A great opportunity to make use of the Live Comp mode on my Olympus E-M1 and thought I’d write a little bit about it. In short: Live Comp mode allows you to take long exposures without overexposing your final image. The difference between Live Comp and the classic Bulb mode is that Live Comp analyses the scene and the sensor will only add light where new and brighter light is produced. This means that I can expose for a scene as usual using manual mode, setting my shutter speed, aperture and ISO, baring in mind that the fastest shutter speed I can use in Live Comp mode is 1/2 sec (and a maximum of 60sec). So it really only works well at down, dusk or night (or with ND filters – then any time of the day) – or on really really dark stormy days. So once you found the right settings to properly expose your scene you just hit the shutter button on your camera and off you go. Gone are the days of guessing (or mathematically working out) the exposure time your camera needs to get a perfectly exposed image – no frustration over overexposed white images or completely dark underexposed images. The E-M1 will now tell you how much time has elapsed and how many exposures the camera has stacked into the one image so far. Now the really cool thing about Live Comp is that you can actually see how the camera builds up the image as it is capturing it on the screen. 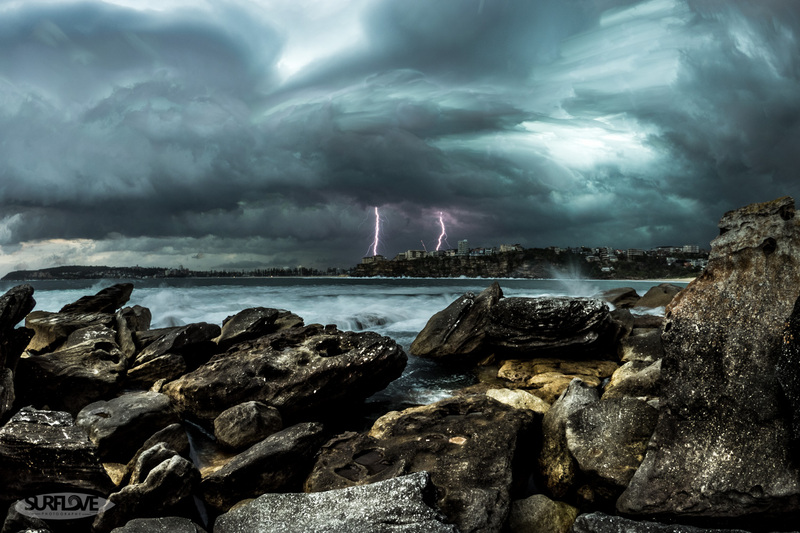 For example: In the case of a dramatic storm approaching and putting on a lightning show just as you can see in some of the shots below. For the above shot live comp mode came in really handy. Once I framed my shot and found the right settings (1/2sec, f/22 and ISO200) I switched to live comp mode and set shutter to 1/2sec in the Live Comp menu and started shooting. Now all I needed to do is keep an eye out for lightning and hope it would strike somewhere in the area of my frame. Happy with my initial composition I pushed the shutter button a second time t0 finalise the exposure. Below the edited version of the first shot. I’m quite happy how it turned out. All editing was done in Adobe Lightroom 5. I purposefully left the shot dark as I really liked the mood and as you can see in the original it was actually quite dark. The storm was approaching fast and I was hoping that the lightning would soon strike closer. As you can see I did lighten up the bottom half of the image a little. I knew that the rocks would look great with some editing and was hoping I could create a little contrast with the sky to create the right mood. The exposure time for this was about 3minutes at 1/2sec shutter speed, f/22 and ISO200. I really like how the clouds in the top of the image were moving quite fast and created a twisty ‘speed’ blur effect opposed to the darker clouds moving much slower in the center of the shot. It really draws the eye to the center where the action is happening. I cropped in the image a little from the bottom too, just to make the rocks a little less distracting. 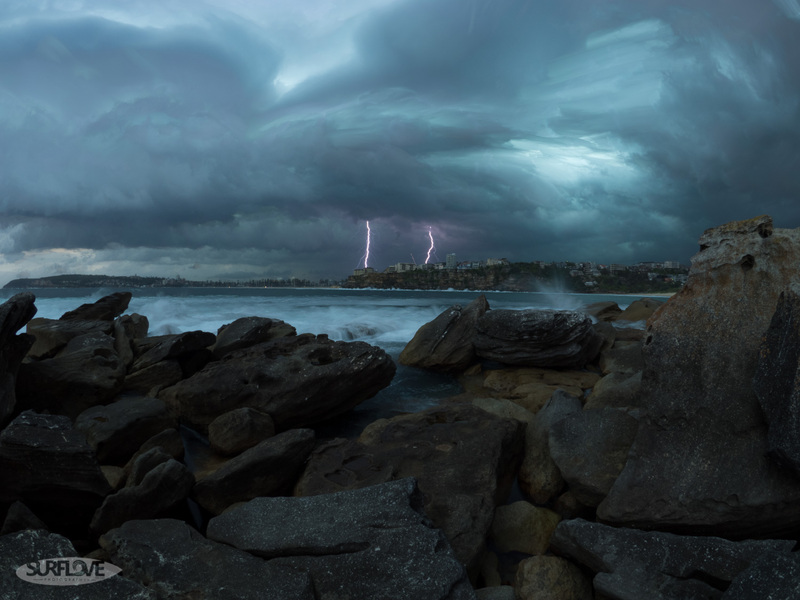 I suddenly had some shot come to mind capturing the rock pool and swimmers and some more lightning in the background. ‘Fearless Storm Swimmers’ or something like that… but the storm was too fast and I found myself testing the weather sealing of my camera about 2 minutes later. 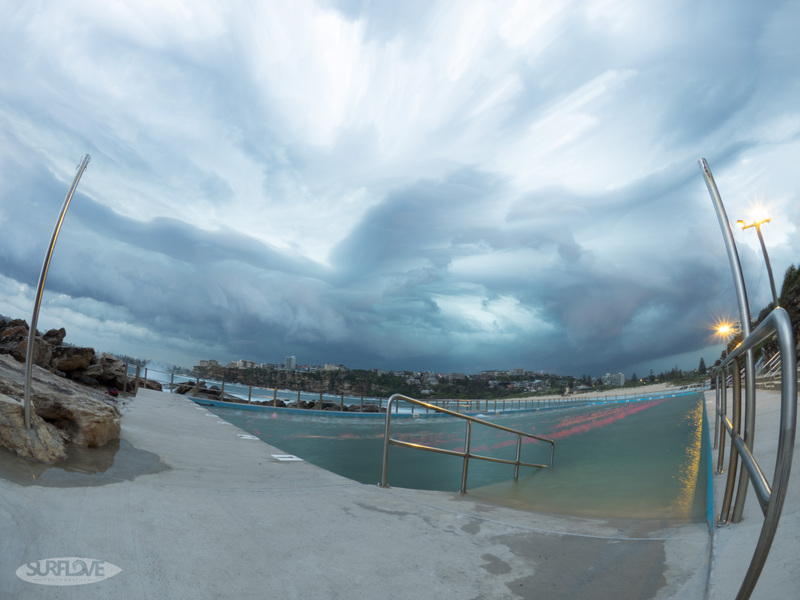 As you can see there were still a few brave swimmers doing there last laps at Freshwater rock pool – the live comp exposure blurred them nicely. 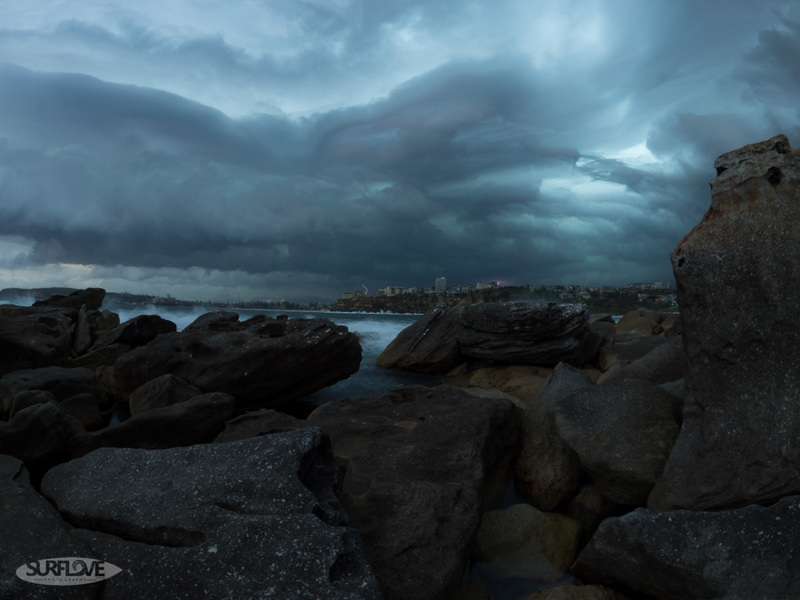 I shot this with the Panasonic f/3.5 8mm fisheye to cover a maximum amount of sky – in the hope to capture some lightning. Before capturing the actual Live Comp the camera takes a ‘black’ image to analyse the scene and find out where the image is likely to produce noise. (the grain in your images you tend to get on long exposures). It uses this information to cancel out noise on the final image – and it does so in a very effective way! I’ve shot a 25minute exposure of stars and the image quality was stunning! 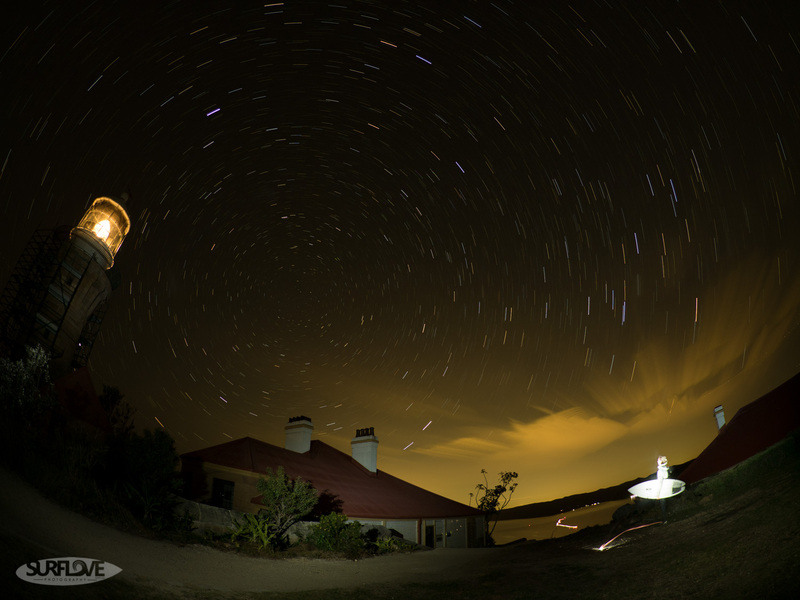 As if I had shot at ISO200 – but I had a beautiful night sky with star trails. With the shot building itself up on screen I could really ‘build’ the shot as time was passing. I could see the star trails forming with every minute passing by and noticed that my foreground was staying dark and that the light house wasn’t showing up as much as I had hoped for. No problem though: I used a torch to lighten up the light house, the building, the pathway and the right side of my scene (red markings) and after further minute I could see things coming together nicely on the screen of my E-M1. A few minutes into the shot I had a further idea: Why not add a person holding a surfboard int he shot? So I put the torch on the floor (blue markings) and stood in front of it for about 20 seconds. Knowing I’d be brighter than the background I was almost certain I would appear in the shot. the areas that I lit up with a torch and adding myself into the shot holding a surfboard. ‘Starsurfer’ was created. As you can see, live comp mode really opens up a whole new way of photographing the world around us. I’m certain there are many other great ways to make use of it – I really love it when cameras give us new features and possibilities to be creative. Thanks Olympus for coming up with this great feature – I hope other manufacturers follow soon. Hope you enjoyed my article on Live Comp mode and on what I have been doing with it so far. Great article! I love using this feature on my EM1 as well, I am exploring a whole series using this feature. Thanks for the well written and very helpful article! Keep up the great work and those shots would look awesome on a metal print! I’m keen to see your series of photos with the live comp mode. It really offer a great new way to capture the things around us and I’m finding new ways to use it nearly every week! Really good stuff! 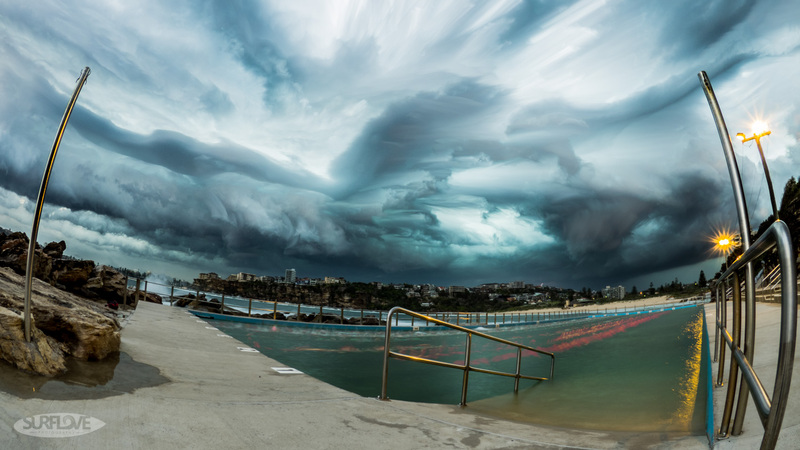 Your pictures of the storm and the lightning are particularly good. I had used the LiveView feature on the EM-1 but was not aware at all about Live Comp. Now I really have to give it a shot. Yes traffic is a nice one for live comp – I have yet to try it on that. Thanks Chris for sharing a feature of the EM1 that I didn’t know about.